This looks delicious. I have shrimp planned for next week. I can't wait! Oo now I wonder what you're going to make with shrimp? Pizza is totally healthy. So says the doctor! But this is definitely super good for you also! 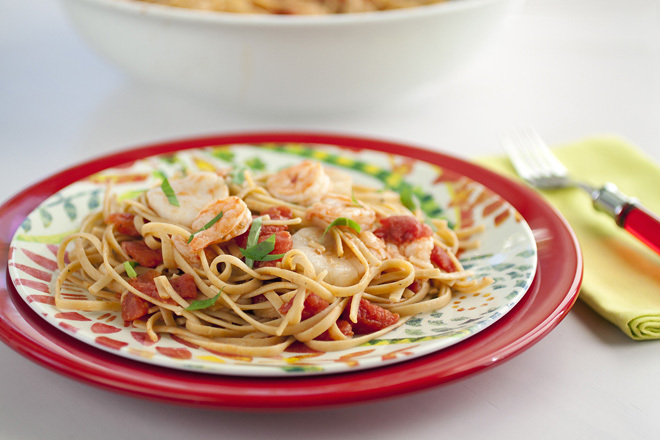 Shrimp and scallops are rock star protein sources! Love shrimp, love scallops, love pasta, love this! And hey, did you ever pick a winner for that cookbook? I did V. Well the number generator did. It was Betty from Scrambled Henfruit. Yummy! I love shrimp, and scallops together! This looks awesome!